CAN POSITIVE OR NEGATIVE THOUGHTS AND HOW THEY ARE EMOTED AFFECT YOUR BODY, MIND AND SPIRITUAL HEALTH? Can positive or negative thoughts and how they are emoted affect your body’s delicate biochemistry or its acid/alkaline pH balance? Love, fear, joy, anger, sadness, happiness, resentment. Can positive or negative emotions affect your body’s physical, mental and spiritual health? Is a woman more likely to become pregnant if she eats a lot of vegetables or if she were to go on a long, relaxing vacation? Are you more likely to do cancer if you have a hot temper? Do people who laugh a lot live longer? Does your anxiety or fear of crowds, elevators, blood, heights, spiders, hospitals, or airplanes somehow affect your health? My theory of one sickness, one disease and one health, are set forth in what I call “The New Biology,” not only considers how our diet affects our physiology, but also how our psychology affects our physiology and how our psychology affects our spirituality. Bottom line, your mental state is ever so critical. In so many ways, your mental state, if it’s negative, can create more metabolic acids than the acidic foods and drinks that you’re ingesting. In fact, you can create two or three times more metabolic acids from your thoughts or your mental and emotional state than from ingesting highly acidic foods like dairy, animal protein, sugar and alcohol. 1) When you have a thought or say a word, it requires electrical or electron energy for the brain cell(s) to produce those actions. 2) As you carry on with that thought, you are burning or consuming energy in the form of electrons. 3) When you are consuming energy or using electrons in your thoughts, you are producing biological waste products called acids which are an energetic waste product which can be measured in pH, oxidative reduction potential (ORP), hertz and decibels. 4) Next, if the metabolic acidic waste products from your thoughts are not properly eliminated through the four channels of elimination which are urination, perspiration, respiration or defecation, then the acidic waste products from your thoughts are moved out into your interstitial fluids and the pushed out into your connective and fatty tissues because it must not be allowed to affect the delicate pH of the blood. This delicate balance of the blood must remain quite constant at 7.365 and the interstitial fluids at 7.2, in order to remain healthy. 5) What happens next is this. As the excess and overload of acidic waste products are thrown out into the body tissues, this can easily lead to all sorts of symptomologies: lupus, fibromyalgia, Lyme’s, arthritis, muscle pain, fatigue, tiredness, obesity, cancerous breasts, a cancerous prostate, a cancerous stomach and/or bowels, indigestion, acid reflux, heart burn, heart attacks, multiple sclerosis, Parkinson’s, dementia, autism, and the list goes on and on. For example let’s say you’ve been doing sadness or depression. This downer feeling is coming from a negative experience that you keep looping and re-looping in your head. It’s like a mind movie. It’s a mini-drama that you keep playing over and over. And because you are constantly thinking about it, eventually you even start to be concerned or worried about the fact that you are so preoccupied with the whole affair. So now in addition to the sad drama, you are experiencing upset about the fact that you’re having the drama itself. All of this thinking requires energy and when you’re consuming energy you are also producing metabolic acidic waste products. Do you know any angry people? You may not know it, but many people who become angry easily not only get angry at various people, events, and situations, but eventually they are irritated with themselves for being so angry at everything else. Anger, for instance, requires a tremendous amount of energy and emits a great deal of electrical energy. You have undoubtedly felt the vibrational energy of someone who is angry. Or maybe you have felt your own anger and how it can upset your physiology, i.e., especially an upset stomach and bowels with excess acids leading to indigestion, stomach pain, acid reflux or ulcers. Even worse, many of these negative emotions are chronic and can be traced all the way back to early childhood experiences. So, at one level or another, it’s been going on for a long time and creating excessive acids all along. c) both! Some “children” remember these events forever! It is during these vulnerable and unprotected years that we often plant eternal seeds of emotion that will yield an unwelcomee harvest of acidic internal results, perhaps throughout one’s entire life. The turmoil between parents and children, not to mention the conflicts between children and children, have been documented by many thousands of social science books and articles. So, let’s take a look at all of that emotion. Perhaps you are feeling a strong emotion. It could be any emotion. First of all, emotions are energy in motion. When you are (e)motional, you are energetic, either in a positive or negative way. And if you are energetic, you are literally energy in (e)motion. You are now producing metabolic acidic waste products (lactic acid, uric acid, citric acid, just to name a few) at a very high rate which is a waste product of such (e)motions. The rate of acid production in an (e)motional state can be even greater than that of someone who is jogging or working out. So, your thoughts do become biological or metabolic acids that can make you sick, tired, depressed, angry and even too fat or underweight. When you start producing acids with your thoughts, words and actions, what happens inside? First, you activate the alkaline-buffering systems of the body in order to neutralize these (e)motional acids. The body begins making a primary alkaline buffer known as sodium bicarbonate. It’s actually made in the stomach cells from salt, water and carbon dioxide from the blood and during its production, it creates a waste product known as hydrochloric acid. Hydrochloric acid is a poisonous acidic toxin and cannot remain in the blood or in the stomach. So it is dropped down into the gastric pits of the stomach. This is why people get upset stomachs or become constipated when they are (e)motional. This increase of sodium bicarbonate is critical in maintaining the alkaline design of the body, the pH of 7.365 for the blood and for maintaining alkalinity of the interstitial fluids of the interstitium which is the largest organ of the human body. If these metabolic acids, including hydrochloric acid, are not buffered and/or eliminated through the four channels of elimination, they can create serious health challenges in your body, in your mind, and in your soul. On the other hand, positive (e)motions, such as love, peace, hope, faith, joy, forgiveness and charity can be alkalizing to the blood and tissues. These (e)motions require far less energy and can cause you to be relaxed in your mind and stop the playing of some acidic movies in your head. Students of higher consciousness know that you can even enter into a state of bliss wherein you have no thoughts and wherein you are producing zero metabolic acid. For myself, I have decided to call this wonderful place “Young Charity.” That’s because I exercise and meditate every day. And I Love it! And it raises my level of consciousness and positive connection with the world. The connections between “Young” and “Charity” are numerous. My name is Young, of course, but more importantly, being young is a term we normally associate with being youthful, energetic, open, optimistic, and filled with excitement. And the ultimate purpose of life is Charity. And Charity is the sweetest expression of life. So “Young” and “Charity” go together. To be sure, I Love my exercising and it Loves me back in terms of its gifts to me. I find myself Loving this state of bliss daily which I know is helping to alkalize my body. That is why I am addicted to why I Love this type of alkalizing exercise that I do every day. It’s called a Positive Addiction. I Love to have my friends and guests work out with me as I lead them through the steps. I teach them the “Young” version of Yoga. I tell them that it is known as “Younga Yoga.” They Love that. (Well, at least they laugh.) It incorporates proper breathing, stretching, toning, mediation, relaxation, and of course some sweating to remove yesterday’s dietary and metabolic acids and to help bring me into a state of happiness and bliss. Now. this next thought is very important! The negative emotions of anger, resentment, and fear­ being the most powerful and acidifying of all emotions are all highly acidic to the blood, interstitial fluids and tissues and in many ways are paralyzing to all bodily functions. Over time, the fear of the unknown is probably the most powerful and acidic of them all. Fear is so devastating to the body that even if you’re on an alkaline diet, overcoming a serious health challenge is practically impossible. When you’re eating an alkaline diet and you are doing everything you know how to do, and yet you are overwhelmed with worry, doubt and negative emotions, thank God you’re eating an alkaline diet! If your body were not seriously in the alkaline direction, you might very well be experiencing a struggle for your life. Your acidic (e)motions can literally kill you. So the alkaline lifestyle and diet is the saving grace. Knowing that should give you the positive hope that you can hang on to, get through the emotional stress, and still come out physically and mentally able. Hope and positive expectations are always the key, and knowing that you are on an alkaline diet should aid significantly in boosting your hope and confidence. You can live without food for forty days. You can live without water for about four days. You can live without air for maybe four minutes. But you cannot live without hope at all. Hope, positive expectations, confidence in what you are doing, and trust in your own good intentions is the key, and that’s what the pH Miracle Lifestyle and Diet will do for you. It will give you hope. The leading cause of death in the world today is said to be heart attacks. But people are really having “thought attacks,” NOT “heart attacks.” There are studies showing that over 80% of all heart attacks are (e)motionally triggered. I have said that people don’t die of a heart attack. They die of a “thought attack” that medical science simply refers to as a heart attack because that’s the end result. And if you have wondered if you can die from a broken heart, the answer is absolutely!And the cause? Acids from your energy in motion or (e)motion. The loss of a cherished love one can increase your metabolic acids from the (e)motion to the point that it can stop your heart from beating and pumping life-giving blood throughout your blood vessels. And we all know or should know that life and death is in the blood, the most important “organ” of the body. So let’s take a moment to talk about what I do when I have a client who’s in a highly negative acid-forming (e)motional situation and all the body fluids, including the blood, will show a decline in the pH even when this person has been eating an alkaline diet. In order to buffer the acidic forming (e)motions, the client will have to hyper-alkalize the blood, interstitial fluids and then the tissues in order to bring the body back into alkaline balance. When the client is hyper-alkalizing, the pH of the urine will increase into the high 8’s and even into the 9’s. Hyper-alkalization is necessary in order to overcompensate for the negative acidic producing (e)motions and to bring the body back to health, energy, vitality, hope, peace, harmony, love and finally charity. So, does a person have a fair chance of healing themselves from a degenerative disease or dis-ease like heart disease or cancer? Can you ever achieve a state of blissful happiness? Can you recover from the devastating shock of a loss or from having been diagnosed with a scary-sounding health challenge? I say “absolutely, YES!” And, I just told you how. Given the importance of (e)motions in cancer or acidic causation, etc., I have been particularly interested in the unique biochemistry of the “reptilian brain” which includes the Amygdala, a part of the brain associated with the senses and (e)motions and their storage or memory. Acid or sugar specifically activates the areas of the Amygdala. I have often wished that our traditional medical industry would spend some of their billions of research dollars checking out and verifying for the World what I have demonstrated for years that the pH Miracle electron-rich alkaline Lifestyle and Diet would be much more calming to lower (e)motions of grief, shame, guilt, anger, fear, etc­., responses of the reptilian brain as compared to a toxic chemical drug. In our attempts to find a chemical drug to treat almost everything, we (more often than not) create more problems than we eliminate one step forward and two steps backward. I know that attention deficit problems (ADHD) respond to an alkaline regimen….and hyperactivity is an Amygdala function. So it follows that an alkaline lifestyle and diet would produce less overall adrenal “stress” as well (really just the fight or flight mechanism by another name). The pH Miracle electron-rich alkaline lifestyle and diet is calming to the mind and thus calms the negative (e)motions or energy in motion. This appropriate calming of the Amygdala function produces less “stress.” And, with less “stress” you have less metabolic “acid.” And, with less metabolic “acid” you have less sickness, dis-ease, so-called disease, depression and unhappiness. Can our emotions cause cancer? 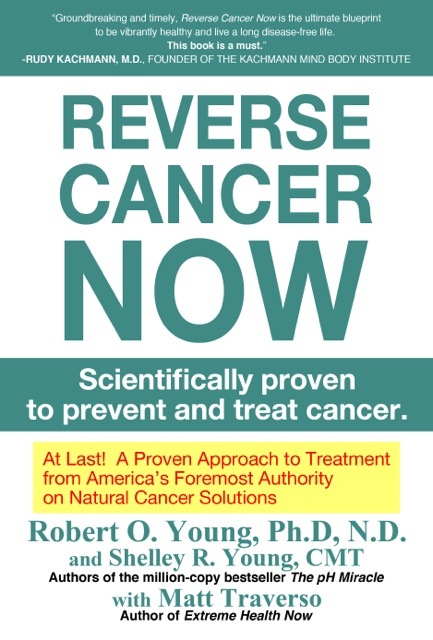 I have said that cancer is a four letter word “ACID.” When you are doing negative acidic emotions, such as anger, revenge, hate, sadness or depression, you are creating metabolic acids that can cause ANY and ALL cancerous conditions across all body fluids and tissues. If metabolic acids are not removed via urination, perspiration, defecation or respiration, then they are delivered to the interstitial fluids and then to the body tissues. When constant excess acidic waste from negative (e)motions are poured into the body tissues, the body tissues will degenerate causing a cancerous condition. Pharmaceutical companies are creating drugs addressing symptoms that may give you the illusion of feeling better, but they DO NOT deal with the causative metabolic acids from eating and drinking and negative acidic (e)motions. This can only lead to more physical and emotional pain and unnecessary suffering. When you are in a negative (e)motional state, it can become impossible for you to heal your serious degenerative or acidic health challenge. But, I will say this: if you are willing to commit to change and begin the alkalizing process, even if you are not completely out of your state of fear, anger, depression or anger, you will begin to put more “Young Life,” “Young Energy,” and “Young Charity” into your body, mind and soul. I have found over the years that when you start feeling better, you start thinking better. And when you start thinking better, you start doing better. So, you don’t have to have your (e)motions completely under control in order to start losing weight, feeling better, reversing a serious illness, having more sustainable energy and to start being happy and more mentally and spiritually connected. When you start the pH Miracle Lifestyle and Diet program, you are then making a conscious decision to try to do a little better. And, when you get on this healing path that leads to “Young Living,” “Young Energy,” and “Young Charity,” this gradual alkalizing process you start having those little and then those big pH miracles. You start feeling better and you start thinking better. And, when you start feeling and thinking better, you realize at some point that you have forgotten your depression and your sadness. Feelings of anger have disappeared and even what you were upset about. You soon forget what you were fearful about in the first place. To learn more about the affect of negative and positive (e)motions on the brain and body and to learn more about “Young Living”, “Young Energy”, and “Young Charity”, read my latest books, The pH Miracle Revised and Updated, The pH Miracle for Diabetes, The pH Miracle for Weight Loss and The pH Miracle for Cancer! May I also suggest starting with our alkalizing support products for opening up the four channels of elimination, hyper-perfusing the blood, interstitial fluids and then tissues with alkalinity, restoring health to the gut, building healthy blood and body cells and finally creating a healthy body, mind and spirit and a life full of joy, peace, happiness, love and charity. Research Reveals: Sugar CAUSES Cancer! Why? Because Sugar is a Metabolic Waste Product – A Poison – A Toxic Acid in ALL of ITS FORMS! According to researchers at the University of California, San Francisco, sugar poses a health risk—contributing to around 35 million deaths globally each year. So high is its toxicity that it should now be considered a potentially toxic substance like alcohol and tobacco. Sugars and the inflammation and acidic environments they create are important constituents of the local environment of tumors. In most types of cancer inflammatory conditions are present before malignancy changes occur. Contrary to this conventional view, the new study “provides evidence that increased glycolytic activation itself can be an oncogenic event…” That is to say, the activation of sugar-based metabolism in a cell – driven by both the presence of increased quantities of glucose and the increase glucose receptors on the cell membrane surface (i.e. “overexpression of a glucose transporter”) – drives cancer initiation.